This year Mt Helm Baptist Church turns 180 years old. Established in 1835, Jackson’s oldest historically black congregation traces our genesis back to the basement of First Baptist Church-Jackson, where our enslaved ancestors worshipped under the watchful gaze of their overseers. As with many black believers who came to trust in the Lord Jesus, these Christians discerned that the Gospel was liberating and life-giving, no matter what heresy was being preached to them by their slavers. This Gospel gave them saving grace and unfettered hope in the face of the systemic sins of race-based oppression. When emancipation arrived in 1865, these baptized believers founded an autonomous Baptist church named in the honor of Thomas and Mary Helm, the white Presbyterian benefactors who donated to the church our first property. Amidst the terrors of white supremacy, God kindly demonstrated divine providence in the days when hope unborn was about to die. 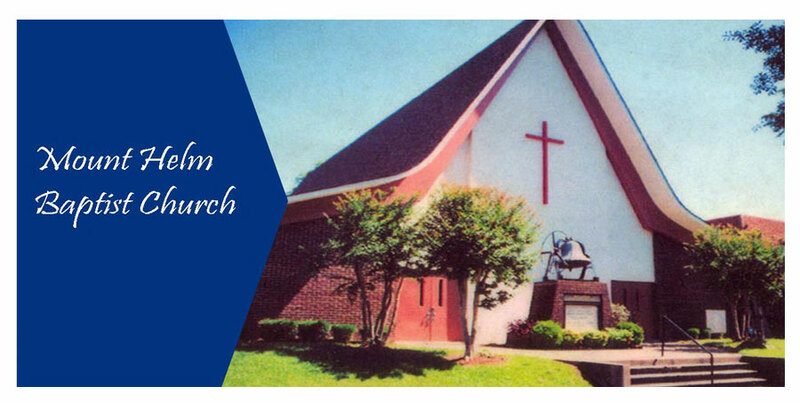 Intriguingly Jackson’s most historic black Baptist congregation is named for a white Presbyterian family, a reality attested by the struggles for identity and ministry that ensued over the nearly two centuries of our church’s life and witness. And yet, 180 years later, the God of our weary years and silent tears keeps making ways out of no way. The Akan people speak of the Sankofa bird, a mythical creature that looks backwards as it flies forward. In this anniversary year Mt Helm has been called to look back at our past and retrieve the lessons necessary for the future. These lessons have been both positive reminders of the good we have done in God’s strength, and challenging reminders that we are often called to repent for the ways in which we have failed to give God the glory. These are lessons that still warrant our attention. One of the great lessons I have learned is that Mt Helm did so much with so little during the Reconstruction era. From 1865 to the turn on the century, our recently manumitted predecessors had a spiritual vitality that not only prepared them for heaven, but caused them to seek a little heaven on earth. Through fervent prayer and collective economics, they made the Gospel visible through missions to Africa and by housing for a few years what we now know as Jackson State University. Evangelism and education served as the foundation of this church’s mission, a foundation sometimes forgotten throughout the subsequent years. During the 20th century church fights and church splits led to the birth of new congregations and denominations. Times of spiritual lukewarmness and missional drift marked much of this long history. Sadly, these situations clouded the good pastors and members did in the name of the Lord. To this day, Mt Helm inspires both pride and lament in persons who know about our congregations more recent checkered past. To be sure, the last thirty years have added great consternation to this complex reputation. Short term pastorates, lasting three years on average, has led members of the Jackson community and throughout the nation to joke about our instability. Since 1977 Mt Helm has had ten pastors. I make the tenth pastor in that parade, the twenty-third of all the pastors combined. In that same space of time comparable congregations like Farish Street, Cade Chapel, and New Hope (Watkins Drive) Baptist Churches have had one or two pastors. In his excellent book Autopsy of a Deceased Church, church consultant Thom Rainer rightly points out that serial short pastoral tenures is one of twelve signs that a church might be sick and even dying. When I came to Mt Helm in 2010 I arrived as a young preacher full of the Holy Ghost, vision, and a Duke Divinity School education. I was naïve. I believed that simply preaching the Word, loving the people, and setting a course for transformation was all that was needed for a church that confessed its desire for reform. I soon discovered that this wasn’t enough for a congregation that was in decline for more than two decades. Change would not come quickly and not without a fight. Though most of the members knew things would only get worse if positive changes didn’t occur, a vocal minority resisted spiritual leadership at every turn. By my third year I was discouraged and dismayed. On the verge of burnout I acknowledged that I could not do this alone and after much prayer felt led to go to a ministry context where my gifts would be appreciated. Some may wonder why I went back. What changed between then and now to lead me to believe this time would be different? Much prayer, intense talks with mentors and colleagues, and a transparent and truthful series of conversations with Mt Helm’s leadership and membership opened me up to the faith that it’s not too late for Mt Helm to turn around. Too many moments in the church’s history have demonstrated that when Mt Helm repents and turns back to God, awesome things happen. Since returning in January I see a greater responsiveness to God’s call to us. A different spirit of worship, fellowship, discipleship, stewardship, and leadership have marked our time together so far. Yes, offering transformational leadership to an established church is rather difficult for a young pastor. In my first three years I often felt like what our enslaved ancestors must have experienced: I was serving God’s people but did so under the gaze of some overseers who monitored what I said and did. Appropriate checks and balances are important and welcome; but terrorizing pastoral authority because a few really prefer a social club rather than a New Testament church wasn’t the Christian thing to do. But I complied with that enslavement at times. I felt shackled by a heavy burden. But after leaving for Alcorn State University God reminded me of the liberating and life-affirming Gospel that I have been called to preach and embody. And after spending too much time trying to please people, I chose to please God. The Lord liberated me on the Reservation beneath the shade of giant trees. The yoke is broken. The chains are off. I am free to lead as I am led by Christ in the power of the Spirit. So this year, with God’s help, I believe Mt Helm will turn around. It won’t be easy and will take some time. But to everything God has appointed a season. Through faith I trust this is our season for revitalization, reform, and renewal. By turning back to God I believe we will turn back to what matters most to us as a ministry. We will keep the main thing the main thing and do what brings God glory. As former pastor T.B. Brown eloquently stated forty years ago, ours too is a time of compromise and retreat and we need Mt Helm to be a church that makes the Gospel visible. In the best of times evangelism and education, missionary zeal and community-focus, spiritual depth and biblical justice marked us. By returning to these values Mt Helm’s latter days will be greater than our former ones. I pray that you join us on this journey toward God’s preferred future for us. We remember that we exist to the glory of God so that through us changed lives can change the world. This old ship of Zion has had many passengers and we still have room for more. May the Holy Spirit fill our sails and propel us to deeper ministry in the Name of Jesus Christ.